The majority of internal problems in organizations are directly related to poor internal communication management. Not solving them in time ends up affecting other areas of the organization and can result in bad feeling and weak relationships among your employees. For that reason, detecting the main problems in internal communications is essential in stopping them from growing out of control. But what are the most frequent problems? 1. Confusion: When your company does not communicate properly, discourse is lost and the strategic lines become unclear. If there isn’t good communication among employees, each will understand things in their own way and the lack of a common discourse will confuse your employees. 2. Culture based on distrust: If no one is certain what the reality is, you will generate a climate of distrust, a lack of connection and credibility. 3. Demotivation and a loss in productivity: If your employees feel that they are not informed about what is happening and that their opinions and ideas don’t matter, they will lose interest and passion for what they do; and this will make them less productive. 4. Deterioration in the work climate: If you don’t let your employees speak and don’t listen to them, the slightest thing can end up in negativity, secretism and gossip. 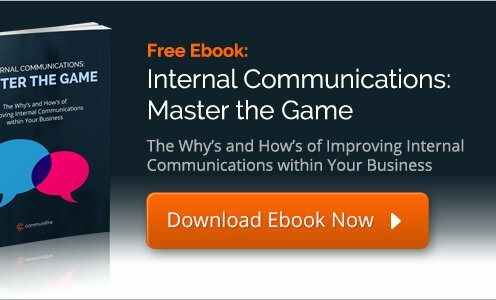 Until now if you didn’t value internal communication in your organization, now is time to do so. The first thing you need is a change in mentality and attitude. The world has become social, so your company must become social too. It’s a cultural challenge. Make your employees believe that their vision matters to you and provide them with the tools to make communication in the organization simple, fast and fluid. This will help you to recover motivation, increase engagement, detect problems quickly in order to solve them, and identify positive elements to reinforce them. In the end. First, launch yourself into adapting your organization to the new Enterprise 2.0 culture. And then find the platform to help you do it. For us, adopting an Enterprise Social Network is the perfect solution. Have you thought what would be the ROI of implementing one in your organization? the information exchanged inside and outside an organization.